Honestly, they could've done better by making it wider, and lower. The side profile of the car makes the car look like an Echo. But is it just me? Or is this car growing on me? Ugly. Sounds like a good car underneath, but I shudder at the thought of having to see these things everywhere. I think it looks pretty good for a 20K car. Better than the Civic IMO. Designers need to realize that huge side profiles make the 17s look like 13s. I hate the beltline on these cars. The se-r package does not look aggressive at all- its too.. cute. This car looks like a Caddy CTS. I was pretty underwhelmed with the new sentra styling, but this model is starting to draw me in, well basically the engine is drawing me in. Would like to see a comparo of this, the si and gti. SER video cruising the street. I wish I could get some sound working. Nice vid, I'm getting used to the front and rear, but I won't ever get used to the ugly sides. They just totally kill the car. My sentiments exactly, they sure don't look like 17s in those pics. I don't think the car is that bad, it's a baby Maxima. The side profile is way too high though. i didn't see it in the article, but, does the spec-v also have rear torsion beam? The Spec V model is available only with a close-ratio 6-speed manual transmission. It also has unique suspension, brakes, tires and body structure changes (versus the base SE-R). nevermind. i'll assume "unique" means fully independent front/rear. I agree that the Civic is getting uglier over time. The front end just looks awkward from certain angles. But it still looks better than the Sentra. I was thinking the same thing the other day. I really liked the new Civic design when it first came out, but now I think it looks ackward and ugly from certain angles. It's not a design that ages well IMO. I hated the new regular Sentra, but this model actually looks very nice. The new Sentra looks like a minivan. I don't think there are any 'gross' cars on the market from any company. You are WAY off base. That could add to its resale value. First mod would be a 3 inch drop on that thing. You could go WRC in that beast with the height it's at. Nissan's 2007 Sentra SE-R has a legacy to carry on. When the first-generation SE-R was released in 1991, it hit the brand-new sport-compact market with an irresistible combination of performance, style and price. Today, the 1991 SE-R is remembered as the car that Nissan got right in every way. With the introduction of the third-generation Sentra SE-R, Nissan is hoping to get it right again with the high-performance Spec V. But following the same formula isn't going to be easy. That's mostly because the new Sentra shares a chassis platform with the upcoming Nissan Rogue crossover SUV, so it's even taller and wider than the Acura TSX and Mazda 6 midsize sedans. It's hard to call the Sentra Spec V a sport compact ("sport midsize" just sounds wrong), yet it's clear that Nissan is hoping this car will compete with the Honda Civic Si, Mazdaspeed 3 and Subaru WRX. The Spec V is one of two Sentra SE-R models. It's a dedicated high-performance package, with more power, a six-speed manual transmission and a special chassis calibration. The conventional SE-R also has a uniquely tuned engine (although with 177 hp), but it's matched with a continuously variable transmission (CVT) and a chassis that's not meant for maximum attack. Thanks to a base price (including destination fee) for the SE-R Spec V of only $20,515, Nissan has nailed the low-bucks budget of most of its SE-R buyers. But when it comes to styling, the new Sentra doesn't live up to the SE-R formula. We'll admit that the original Sentra SE-R couldn't exactly be called striking, but it had excellent proportions that gave it a purposeful look. This 2007 Nissan Sentra looks confused. Its arched roof and short rear deck seem awkward at best, and even a lowered suspension and big wheels can't disguise the look of a utilitarian commuter car. With 200 horsepower and 180 pound-feet of torque, the Spec V's revised DOHC 2.5-liter inline-4 is now on par for the class. The long-stroke engine has enough torque to motivate the chassis in engaging ways, while now a screaming 7,000-rpm redline helps give it a new dimension of performance. The QR25DE engine doesn't pull with the same fervor at 6,500 rpm that it does at 5,500, but it is still a huge improvement over the old lump that was done making power well before its fuel cutoff at 6,200 rpm. There's lots of power under the curve, so it's very drivable no matter how many revs you have on the tach. Of the two Sentra SE-R models, only the Spec V gets a six-speed manual transmission with an optional helical limited-slip differential. The Spec V also has a special suspension setup with harder bushings, more aggressive strut and damper tuning, a ride height that's 10 millimeters lower, and a larger 25-millimeter front stabilizer bar. There's a strut-tower brace up front, plus an interesting V-shape chassis brace between the rear dampers that means you have to sacrifice the base Sentra's fold-down rear seats. There are summer-spec 225/45WR17 Continental SportContact2 tires at all four corners. The Spec V also gets big 12.6-inch front brake rotors, which are almost a full inch in diameter larger than those of the regular SE-R.
Drive the Spec V at 7/10ths and you'll be impressed by its composure. Its steering and brakes keep up with the cornering demands and the chassis tuning feels appropriately sporty. Once you start turning the screws, however, it becomes evident that the Sentra chassis suffers from crossoveritis. Like a crossover, the Sentra has a long 105.7-inch wheelbase, and it's tall at 59.1 inches. There's no shortage of cornering grip, but you will feel plenty of body roll because of the car's crossoverlike height. The Spec V also rides pretty busily on city streets (especially at the back of the car), although when you're driving fast on less-than-perfect back roads, you'll discover there's a good compromise of spring and damping rates. Thanks to its limited-slip differential, the Spec V is especially adept at putting the power down through tight low-speed corners. Just be sure you've got a good grip on the wheel, because the combination of the engine's considerable torque at wide-open throttle and the helical-type limited-slip differential will lead the Spec V to carve a line that might require you to unwind the wheel at the exit of the corner. We were able to find a good driving rhythm in the Spec V, and it probably was as quick as a Civic Si over most roads. The SE-R's steering feel and overall composure aren't as refined as those of the Honda, however, and you'll notice this as you approach the limits of the chassis. At least part of this equation is the Spec V's weight. At 3,080 pounds, this car is 135 pounds heavier than the Civic Si sedan and about 300 pounds heavier than the previous-generation SE-R Spec V.
Despite its composed personality, the Spec V has respectable performance on the test track. It hit 60 mph in 6.7 seconds and broke the quarter-mile traps in 15.1 seconds at 92.6 mph — a quicker performance than the Honda Civic Si sedan. The Honda hit 60 mph in 7.1 seconds and went through the quarter-mile in 15.3 seconds at 93.3 mph. The Spec V split the slalom cones at 64.7 mph, which ties it with the Subaru WRX, although this is slower than many cars in the class, probably a function of the Sentra's size. At the same time, the Spec V's grip on the skid pad is very good at 0.86g. These big brakes stopped the Spec V from 60 mph in 125 feet — the same as the Civic Si sedan. The SE-R interior has a few touches to remind you this isn't your mother's econobox. We like the comfortable cloth-upholstered seats, although the bolsters aren't supportive enough. The good news is that the Spec V is genuinely capable of carrying four medium-size people in reasonable comfort. We loaded someone 6-foot-2 in the back, where he complained of limited headroom but found the legroom adequate. With 97.7 cubic feet of passenger volume, this is a spacious package. The stereo controls are easy to figure out and the huge center-mounted volume knob offers satisfying punch when the car is optioned with the eight-speaker, 340-watt Rockford Fosgate audio system, which includes MP3 capability. The rim of the leather-wrapped steering wheel nicely fills your hands, and it's trimmed with red stitching just like the seats. The front seatbelts are also red — not the kind of style choice we'd make. With decent performance numbers, real-world usability and competitive pricing, the Spec V comes closer to the magic SE-R formula than we anticipated, given its size. The only real obstacle facing the Spec V is the fact that its arched roof line and tall profile scream "frumpy commuter car" much louder than its low-profile tires and semi-sporty exhaust note declare it an official sport compact. Nissan tells us that about 10 percent of Sentra sales have traditionally been SE-R models, and the high-intensity Spec V has comprised the majority of that number. SE-R enthusiasts are clearly a dedicated crowd, and we'll see if they start hanging wings and spoilers on the Spec V or get used to crossing over to its newly adult personality. And it seriously disturbs me that it shares a platform with a crossover. Lemme prop my car up on some stilts and @#$%ing pogo sticks and see how graceful it is then. Oh, that's right, this still won't go offroad (I'm looking at you, Caliber). dang, this thread was last touched in 2007! No love. Could this be the new Sentra? Very likely. 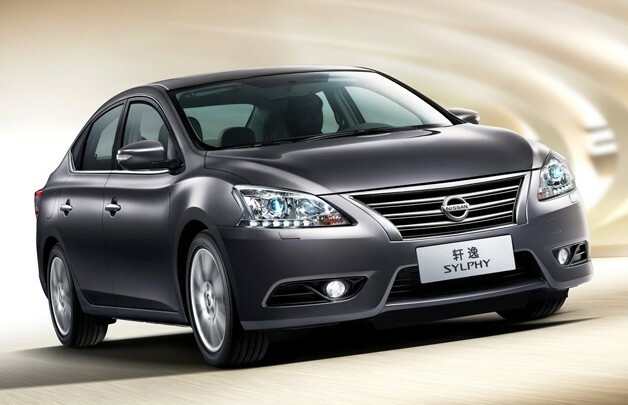 If that is the new Sentra then it's a tremendous improvement (stylewise) over the current generation. I like it but, it'll get hated on here on Azine nontheless. Personally I love that wood interior. I know it's cheap/fake, but I prefer its look over Acura's obsession with the painted metal trim they're slapping on everything. Nissan's design strategy as of late I feel is moving in a better direction then say... Honda?